Tree of Life: The guru on the path between Chesed and Tipareth. Concept: To behold the accomplishment of a lifetime's worth of adherance and to become so inspired to take up a passionate course of action. Description: The Hermit wears red and black diamond patterned clothing. He holds a pocket watch that has a cracked face and will not move past the hour for tea time. His beard is long and his fur is greyed. His staff he doesn't lean on heavily but rather toys with it in his fingers. He looks off into a Winter grey morning while snow sits atop the summit of his mountain perch. Character: "Where I am, you to one day can be." The Hermit is reputed for his experience and sage advice. Many seek him out in times of trouble and confusion looking for answers to their perplexing circumstances. The Hermit is distant, outside the realm of commonplace society, atop a mountain. But do not confuse his peak with the top off the Mountain of Attainment. This mountain simply represents distance and experience, not satisfaction per say. The grey is not the desireable gold of our beloved Mountain of Attainment. The Hermit can see that mountain in the distance. From this distant perspective, where others' desires cannot be felt, where what you want to have is in sight, where the Hermit has chosen to not be a part of it, his solitude affords him great insight. When he returns to the world, he will know how he fits in among everything else. You only know your true shape after you've left an empty void that only you can fill. Meaning: Stepping outside of yourself, our daily routines, to find perspective. Find a vantage point from where you can see what truly matters. Go without to look within. Notes: The White Rabbit from Alice in Wonderland has grown up, older, wiser. Instead of leading one down a rabbit hole, here the chase has led us up a mountain where the focus is solely on rabbit's journey. 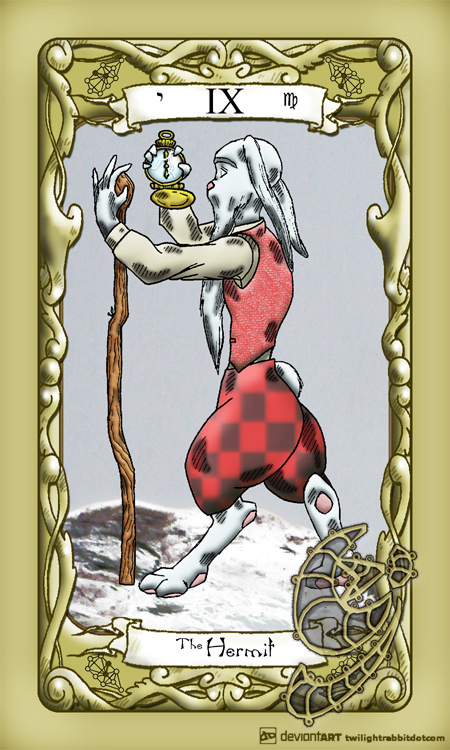 Here the rabbit will teach the lesson needed so direly to navigate the Wheel of Fortune.